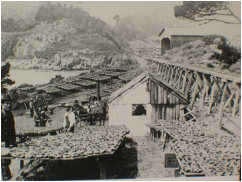 This photo, taken from the north side of Whalers Cove, shows the Point Lobos Canning Co. owned and operated by A.M. Allan and Gennosuke Kodani, one of the earliest Japanese immigrants to settle during the 1890s on the Monterey Peninsula. 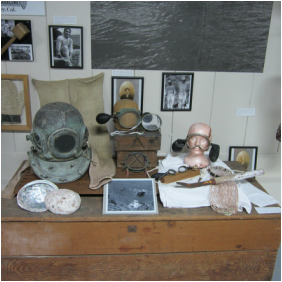 On exhibit in the Heritage Museum is an old dive helmet used for abalone fishing since the 1890s. Roy Hattori was the youngest Nisei diver to use this type of helmet and suit for abalone fishing in the local area. 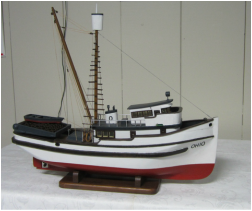 The Ohio is a sardine fishing boat owned and used by the Manaka family before the outbreak of WWII. This wood model of the Manaka boat was made by a family friend, Shig Nakaji, while living in the Poston camp. 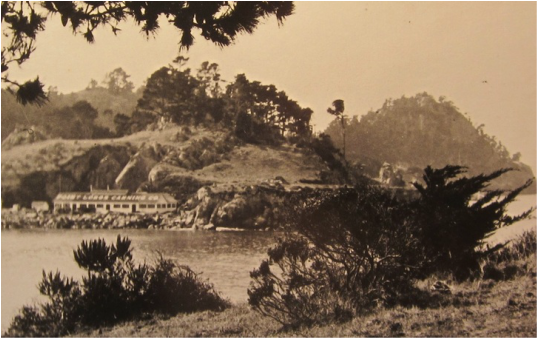 In 1904, this Japanese Teahouse was built at Lovers Point in Pacific Grove. 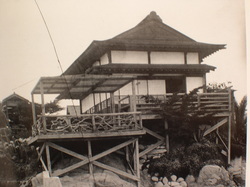 The teahouse was financed by Mr. Noda and constructed without the use of nails by Kohachi Handa. Unable to obtain a new lease, the teahouse closed in 1918. The Monterey JACL Hall was built in 1926. The Nihonjinkai (Japanese Association) organized and funded the land purchase and building construction. Aside from repairs and changes (like the ramp) to comply with code and federal law, the original structure and distinctive Western False Front architecture remain the same. During WWII, the Hall was used as an armory by the California National Guard. In the immediate post-1945 era, the Hall served as a hostel for people returning from the camps. Today, the building is used by the JACL Language School and by several diverse community groups. 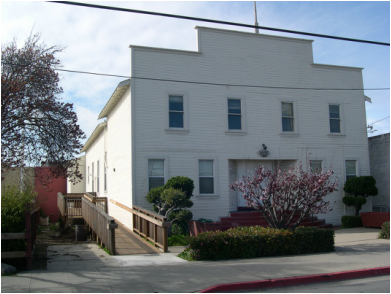 In April of 2003 the Hall was designated as a historic landmark by the City of Monterey.